When I sit down to create a new menu and grocery list for the week, I always start by grabbing a few of my favorite cookbooks and taking a browse through a couple of my favorite food blogs. I then select main dishes that are appealing to me. Sometimes only one or two will stand out at first, and I’ll fill in the rest as I go along. Once I’ve selected main dishes, I write them down on my weekly menu sheet. Next, I fill out the menu by adding side dishes that are nutritious and that are compatible with the flavors of the main dishes. These ideas usually also come from my favorite cookbooks and websites. I write the side dishes on my weekly menu sheet. I take note of anything that I may need to keep in mind for certain dishes, like soaking dry beans ahead of time, for example. These things are written in the “Notes” section on the right side of my weekly menu sheet. I also note where the recipe can be found, and print copies if necessary. Lastly, I build my grocery list from here, by going through each selected recipe and adding any ingredients to my list that I don’t already have in the kitchen. I complete my grocery list by adding anything that is needed or wanted for snacks, breakfasts, or other household needs. I re-organize the list by grocery store section – group all produce items together, etc. 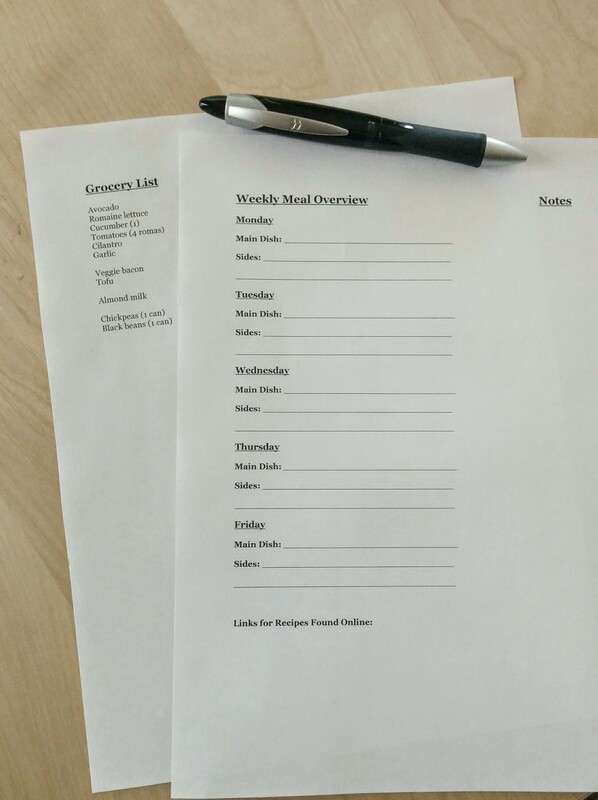 Now I can visit the grocery store with a plan, and I also don’t have to worry about planning meals for another week! One thing that I’m doing is starting with veggies and building my dishes around them, (when I’m not following a recipe). For example, delicious and nourishing breakfasts will consist of things like a vegetable skillet with avocado and beans. I’ll sometimes turn it into a tofu and veggie scramble. Another easy breakfast favorite is flax and pumpkin seed cereal with almond milk and bananas or berries. Lunches are usually tossed together using whatever veggies I have in my refrigerator, combined with a protein source like beans, legumes, or nuts. For dinners, I try to include at least one green. I usually go for two vegetables and a protein, or something like a homemade lentil burger topped with fresh veggies, and something on the side like kale chips or rainbow carrots with sage. It takes a little planning, but it isn’t so bad once the routine has been established. Eating is more enjoyable when you can feel good about your choices! Also, I challenge those that believe that healthy foods are boring or less satisfying. 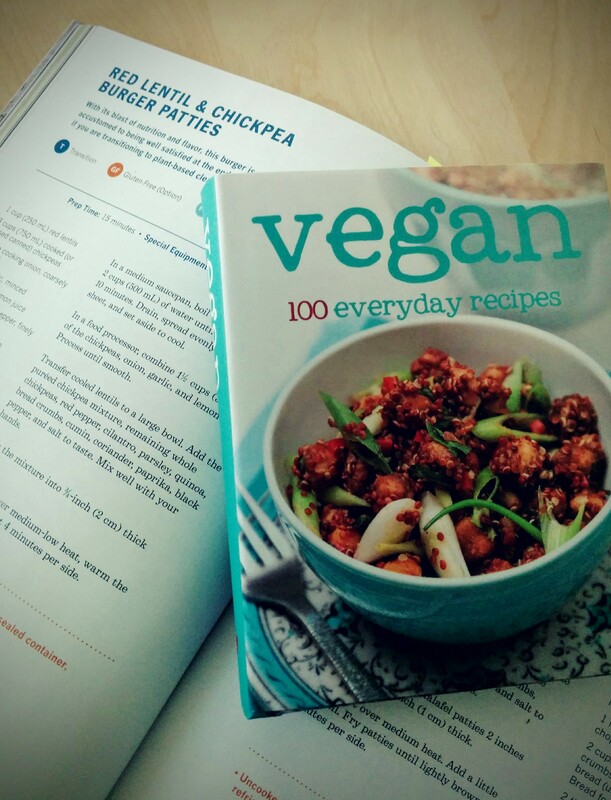 Try tasting some colorful, flavorful plant-based recipes like the ones from Thrive Energy Cookbook by Brendan Brazier! You won’t be disappointed! I also think of cooking as another form of creativity. Think about the time, effort, and skill it takes for chefs to create the recipes that we use. The process of combining flavors and creating pleasing textures is an art form in itself. I’ve found enjoyment in the process of cooking, and deciding that I’m going to make the most of it rather than dreading it as a chore. I think the key to consistent healthy eating is to have a well-stocked kitchen. Replace potato chips and ice cream with things like homemade kale chips, nuts, and fruit. Re-think certain snacks, and find ways to add more nutrition to them. For example, make popcorn with coconut oil instead of butter, and toss with sea salt – or even add nutritional yeast for a cheesy flavor that’s actually healthy! Create delicious, healthy dips like guacamole or hummus. We’d love to hear about your favorite healthy foods! Feel free to share in the comments below!